NOTE: We have suspended sales of Stacker Light and are offering Advanced Stacker PLUS. Let’s say you’ve got a bunch of 30 second or 300 second night exposures and now you want to make a star trail out of them. Or perhaps you have several dozen shots of clouds drifting through a compelling landscape. If you already have Photoshop CS Standard (or Extended) and want to exploit the full power of Photoshop, this is your tool! If you only have Photoshop Elements you should consider using StarStax (PC or Mac), Image Stacker by Tawbaware (PC Only) or Startrails.exe (PC Only). Even if you already know how to combine those images manually, you are probably not excited about repeating manual steps 20, 50 or 500 times. We are with you! We’ll provide you with a powerful Photoshop plugin that will make that star trail or timestack come together in far less time than doing the steps yourself. In fact, it might take you 1/5 as much time. Get Some Action – Order Here! Unfortunately due to repeated misuse of our site, we no longer sell/offer the Stacker Light action set*. Please note that under the terms and conditions that you agree to, you will be added to our email subscription list. You can unsubscribe or tailor what you are interested in at any time. Please read all the information below before making your purchase. 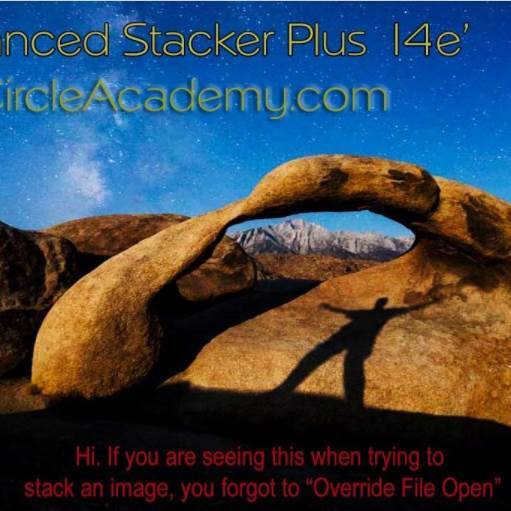 Will any of the stacker products work with Photoshop Elements 10 or 11? Saw your program referenced in an article in DPmag. Sorry, no. We’ve looked into doing something in Elements, but the interface is horribly crippled. You’re welcome to try the “Test Stacker” and see what happens, but when we tried it, the result was unsatisfactory. This was awesome, just did my 1st ever startrail with the test stacker. It would be interesting to see some of the individual images. But in short, lighten mode stacking keeps the brightest part of each image. If the slide that your daughter sits on is brighter than the pants she’s wearing then when you combine two shots – one without her on the slide and one with her sitting on the slide, the brightness of the slide will “win” and you’ll see through her. If you didn’t move the camera or change exposure settings (e.g. used manual settings rather than an automatic setting) a better way to make a shot like you want is to to do masking on layers. The subject of masking and layering is covered in the NP150e and original NP150 courses which are available on video – or you can do some “googleing” and find free resources. Q: I purchased Test Stacker and am unable to find it so I can open it up. The next step is to install the actions. After Installing, we recommend that you verify everything is loaded. Next make sure you’re ready to stack something as described here. We’ve tested the stacker on Windows Photoshop CS2, CS3, CS5, CS6, CC, CC 2014 and on Mac Photoshop CS6, CC and CC 2014.